Václav Havel (Czech pronunciation: [ˈvaːtslav ˈɦavɛl] ( listen); 5 October 1936 – 18 December 2011) was a Czech statesman, writer and former dissident, who served as the last President of Czechoslovakia from 1989 until the dissolution of Czechoslovakia in 1992 and then as the first President of the Czech Republic from 1993 to 2003. As a writer of Czech literature, he is known for his plays, essays, and memoirs. A week before his death, he met with his longtime friend, the Dalai Lama, in Prague; Havel appeared in a wheelchair. Prime Minister Petr Nečas announced a three-day mourning period from 21 to 23 December, the date announced by President Václav Klaus for the state funeral. The funeral Mass was held at Saint Vitus Cathedral, celebrated by the Archbishop of Prague Dominik Duka and Havel's old friend Bishop Václav Malý. During the service, a 21 gun salute was fired in the former president's honour, and as per the family's request, a private ceremony followed at Prague's Strašnice Crematorium. Havel's ashes were placed in the family tomb in the Vinohrady Cemetery in Prague. On 23 December 2011, the Václav Havel Tribute Concert was held in Prague's Palác Lucerna. A large tapestry of Václav Havel with the caption Havel Forever was unveiled on Wenceslas Square on 17 November 2014, the 25th anniversary of the Velvet Revolution. At news of his death, former U.S. Secretary of State Madeleine Albright, a native of Czechoslovakia, said, "He was one of the great figures of the 20th Century", while Czech expatriate novelist Milan Kundera said, "Václav Havel's most important work is his own life." Communists took the opportunity to criticize Havel. Communist Party of Bohemia and Moravia leader Vojtěch Filip stated that Havel was a very controversial person and that his words often conflicted with his deeds. 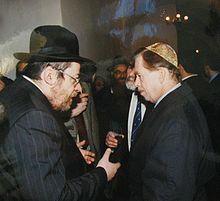 He criticized Havel for having supported NATO's war against Yugoslavia, repeating the charge that Havel had called the event a "humanitarian bombing", even though Havel had expressly and emphatically denied ever having used such a phrase. ^ Webb, W. L. (18 December 2011). "Václav Havel obituary". The Guardian. ^ a b Crain, Caleb (21 March 2012). "Havel's Specter: On Václav Havel". The Nation. Retrieved 16 July 2014. ^ Tismăneanu, Vladimir (2010). "Citizenship Restored". Journal of Democracy. 21 (1): 128–135. doi:10.1353/jod.0.0139. ^ "Prague Declaration on European Conscience and Communism". Victims of Communism Memorial Foundation. 9 June 2008. Archived from the original on 13 May 2011. Retrieved 10 May 2011. ^ "Opening Ceremony, Bruges Campus". Retrieved 2 December 2012. ^ "Prospect Intellectuals: The 2005 List". Prospect. Retrieved 6 April 2010. ^ Webb, W. L. (18 December 2011). "Václav Havel obituary". The Guardian. Retrieved 18 December 2011. ^ a b Zantovsky, Michael (2014). Havel: A Life. New York: Grove Press. pp. 16 (family accomplishments), 55 (marriage). ISBN 9780802123152. ^ "Havel, Vaclav, Contemporary Authors, New Revision Series". Encyclopedia.com. Retrieved 18 December 2011. ^ "::.Václav Havel. ::The official website of Václav Havel, writer, dramatist, dissident, prisoner of conscience, human rights activist, former president of Czechoslovakia and the Czech Republic". Vaclavhavel.cz. Retrieved 19 November 2013. ^ "Václav Havel – Prague Castle". Hrad.cz. Retrieved 19 November 2013. ^ "Václav Havel". Telegraph. Retrieved 19 November 2013. ^ Rissanen, Mika. "From the brewery to the presidency". Retrieved 17 March 2018. ^ Richie Unterberger, "The Plastic People of the Universe", richieunterberger.com 26 February 2007. Retrieved 29 April 2007. ^ a b Eda Kriseová (1993). Václav Havel: The Authorized Biography. Translated by Crain, Caleb. St. Martins Press. pp. 98–99, 168, 202. ISBN 0-88687-739-3. ^ Keane, John (2000). Václav Havel: A Political Tragedy in Six Acts. Basic Books. p. 264. ISBN 0-465-03719-4. ^ 'Catastrophe', Collected Shorter Plays of Samuel Beckett (New York: Grove P, 1994) pp. 295–302 ISBN 0-8021-5055-1. ^ "Václav Havel (1990)". Liberal-international.org. Archived from the original on 26 October 2011. Retrieved 2 December 2011. ^ Thompson, Wayne C. (2008). The World Today Series: Nordic, Central and Southeastern Europe. Harpers Ferry, West Virginia: Stryker-Post Publications. ISBN 978-1-887985-95-6. ^ Ponikelska, Lenka. "Czech Cabinet Meets to Plan Havel's Funeral as EU Holds Minute of Silence". Bloomberg. Retrieved 19 November 2013. ^ "Havel's New Year's address". Old.hrad.cz. Retrieved 2 December 2011. ^ Janda, Vojtěch (3 October 2009). "Listopad 1989: Se svobodou přišel zločin". Deník.cz. Retrieved 1 February 2016. ^ a b Analýza trendů kriminality v roce 2010 (PDF). Praha: Institut pro kriminologii a sociální prevenci. 2011. pp. 124–128. ISBN 978-80-7338-117-2. Archived from the original (PDF) on 14 February 2016. Retrieved 1 February 2016. ^ Analýza trendů kriminality v roce 2010 (PDF). Praha: Institut pro kriminologii a sociální prevenci. 2011. p. 129. ISBN 978-80-7338-117-2. Archived from the original (PDF) on 14 February 2016. Retrieved 1 February 2016. 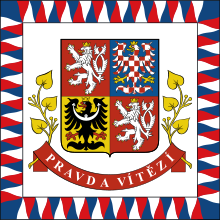 ^ "Počet vražd v České republice". www.czso.cz. Český statistický úřad. Retrieved 1 February 2016. ^ Jedlička, Miloslav. "Jozef Slovák: pětinásobný vrah". kriminalistika.eu. Retrieved 1 February 2016. ^ Jedlička, Miloslav. "Roman Kučerovský". kriminalistika.eu. Retrieved 1 February 2016. ^ Jedlička, Miloslav (20 September 2008). "Vraha tří žen našli kriminalisté po třinácti letech. Díky DNA". iDnes.cz. Retrieved 1 February 2016. ^ Paul Berman, "The Poet of Democracy and His Burdens", The New York Times Magazine 11 May 1997 (original inc. cover photo), as rpt. in English translation at Newyorske listy (New York Herald). Retrieved 29 April 2007. ^ a b "Vaclav Havel". Prague Radio.cz. Retrieved 19 November 2013. ^ Václav Havel, "NATO: The Safeguard of Stability and Peace In the Euro-Atlantic Region", in European Security: Beginning a New Century, eds. General George A. Joulwan & Roger Weissinger-Baylon, papers from the XIIIth NATO Workshop: On Political-Military Decision Making, Warsaw, Poland, 19–23 June 1996. ^ Žižek, Slavoj (28 October 1999). "Attempts to Escape the Logic of Capitalism. Book review of Václav Havel: A Political Tragedy in Six Acts, by John Keane". London Review of Books. Archived from the original on 15 April 2009. Retrieved 21 December 2007. ^ Havel's Medical Condition Seems to Worsen, The New York Times. 5 August 1998. ^ Welch, Matt. "Velvet President", Reason (May 2003). Rpt. in Reason Online. Retrieved 21 December 2007. ^ Václav Havel "Famous Czechs of the Past Century: Václav Havel" – English version of article featured on the official website of the Czech Republic. ^ "Václav Havel". Prague Life. Retrieved 19 November 2013. ^ "Václav Havel: The Emperor Has No Clothes Webcast (Library of Congress)". Loc.gov. Retrieved 19 November 2013. ^ Havel at Columbia; "Celebrating the Life and Art of Václav Havel: New York City, October through December 2006". ^ Capps, Walter H. "Interpreting Václav Havel". Cross Currents (Association for Religion & Intellectual Life) 47.3 (Fall 1997). Retrieved 21 December 2007. ^ Havel at Columbia: Václav Havel: The Artist, The Citizen, The Residency, a multi-media website developed for Havel's seven-week residency at Columbia University, in Fall 2006; features biographies, timelines, interviews, profile and bibliographies (see "References" above). ^ "Honours: Order of Canada: Václav Havel". Archived from the original on 9 December 2005. Retrieved 21 December 2007. ^ "The Havel Festival : Václav Havel". Untitledtheater.com. Retrieved 19 November 2013. ^ "The Havel Festival". Untitledtheater.com. Retrieved 19 November 2013. ^ "Václav Havel on Transcendence | World Future Society". Wfs.org. Retrieved 19 November 2013. ^ Pinder, Ian (16 August 2008). "Czechout". The Guardian. UK. Retrieved 28 August 2008. ^ "Belarus Free Theatre Meet Václav Havel", press release, Belarus Free Theatre, 13 August 2007. Retrieved 31 August 2007. ^ Michael Batiukov, "Belarus 'Free Theatre' is Under Attack by Militia in Minsk, Belarus" Archived 11 November 2013 at the Wayback Machine, American Chronicle, 22 August 2007. Retrieved 31 August 2007. ^ a b Adam Hetrick, "Václav Havel's Leaving May Arrive in American Theatres", Playbill, 19 November 2007. Retrieved 21 December 2007. ^ Daniela Lazarová, "Will It Be Third Time Lucky for Václav Havel's 'Leaving'? ", Radio Prague, 14 December 2007. Retrieved 21 December 2007. ^ "Everyone loves Havel's Leaving". Archived from the original on 30 May 2008. Retrieved 23 March 2011. ^ Feifer, Gregory (23 March 2011). "Havel Film Premieres In Prague". Rferl.org. Retrieved 2 December 2011. ^ "DIVADLO.CZ: Of Pigs and Dissidents". Host.theatre.cz. 29 June 2010. Archived from the original on 18 August 2011. Retrieved 2 December 2011. ^ Callahan, Dan. "Summer Preview: Performance | Theater Reviews | The L Magazine – New York City's Local Event and Arts & Culture Guide". The L Magazine. Retrieved 2 December 2011. ^ "A Song-And-Dance Survival Strategy". nytimes.com. 12 March 2014. ^ "Havel's gift for Obama to be displayed in Prague gallery | Prague Monitor". Archived from the original on 11 April 2009. Retrieved 23 March 2011. ^ "International Advisory Council". Victims of Communism Memorial Foundation. Archived from the original on 22 May 2011. Retrieved 20 May 2011. ^ "Václav Havel byl součástí odvěkého lidského snažení o lepší svět". Denikreferendum.cz. 19 December 2011. Retrieved 19 November 2013. ^ "Český rozhlas Plus (archiv – Portréty)". Prehravac.rozhlas.cz. 18 December 2011. Retrieved 19 November 2013. ^ "Zelené podpořil Havel, vymezují se proti TOP 09 –". Novinky.cz. Retrieved 19 November 2013. ^ "Zelení představili své sympatizanty – Havla, Schwarzenberga a Holubovou". Novinky.cz. Retrieved 19 November 2013. ^ "Havel podpořil zelené. Srovnal továrny s koncentráky". Tn.nova.cz. Retrieved 19 November 2013. ^ "Aktuální zpravodajství | Václav Havel vyzývá občany k volbě Strany zelených | Tiscali.cz". Zpravy.tiscali.cz. Retrieved 19 November 2013. ^ Dan Bilefsky; Jane Perlez (18 December 2011). "Václav Havel, Former Czech President, Dies at 75". The New York Times. ^ a b c "Václav Havel, Czech statesman and playwright, dies at 75". BBC. 18 December 2011. ^ Paul Wilson (9 February 2012). 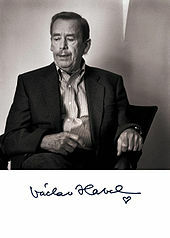 "Václav Havel (1936–2011)". The New York Review of Books. 59 (2). Retrieved 21 January 2012. ^ "Dalai Lama pays 'friendly' visit to Prague". The Prague Post. Retrieved 18 December 2011. ^ "Václav Havel to be given state funeral and highest military honors". Radio Praha. Retrieved 21 December 2011. ^ "Hudebníky napěchovaná Lucerna vzdala hold Havlovi, zazpívala i Vega a Král". iDNES.cz. 23 December 2011. 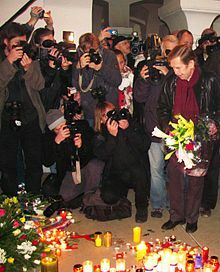 ^ "World Reacts To Václav Havel's Death". Radio Free Europe. Retrieved 18 December 2011. 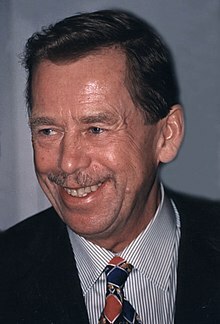 ^ "Russian embassy says condolence on Václav Havel's death was sent to President Klaus". Radio Prague. Retrieved 20 December 2011. ^ "A Continent Mourns the Passing of Vaclav Havel". Radio Free Europe. Archived from the original on 20 December 2011. Retrieved 18 December 2011. ^ Václav Havel, K Falbrově lži, Mladá fronta DNES 24 May 2004: Obskurní pojem "humanitární bombardování" jsem samozřejmě nejen nevymyslel, ale nikdy ani nepoužil a použít nemohl, neboť mám – troufám si tvrdit – vkus. ^ "Petition to name the Prague – Ruzyne airport Václav Havel International Airport". Retrieved 27 December 2011. ^ "Government renames airport after Havel, but botches translation". Prague Radio.cz. Retrieved 19 November 2013. ^ "Letiště Václava Havla". Vaclavhavelairport.com. Retrieved 19 November 2013. ^ Shipsey, Bill. "Václav Havel: Ambassador of Conscience 2003: From Prisoner to President – A Tribute" Archived 21 June 2006 at Archive.today. Amnesty International (October 2003). Retrieved 21 December 2007. ^ "The Club of Madrid". Clubmadrid.org. Retrieved 2 December 2011. ^ "German Group Cancels Prize to Putin After Outcry", The New York Times, 16 July 2011. ^ "Honorary Doctorates". Retrieved 23 December 2008. ^ "Installation de M. Vaclav Havel comme membre associé étranger au fauteuil laissé vacant par le décès de Ugo Papi". Academie des Sciences Morales et Politiques. 27 October 1992. Retrieved 25 January 2019. ^ Gershman, Carl (16 November 2014). "Are Czechs giving up on moral responsibility?". The Washington Post. Retrieved 17 November 2014. ^ "State Decorations". Retrieved 17 August 2010. ^ "Reply to a parliamentary question" (PDF) (in German). p. 1711. Retrieved 16 November 2012. ^ "The Václav Havel Prize for Creative Dissent". Human Rights Foundation. 11 April 2012. Archived from the original on 17 May 2014. Retrieved 1 August 2014. ^ Miloslav Rechcígl (2008). On Behalf of Their Homeland: Fifty Years of SVU : an Eyewitness Account of the History of the Czechoslovak Society of Arts and Sciences (SVU). East European Monographs. ISBN 978-0-88033-630-7. ^ "Václav Havel: Parliament dedicates building to former Czech president". News / European Parliament. Retrieved 19 July 2017. ^ "Official opening of the Havel Building". European Parliament / The President. Retrieved 19 July 2017. ^ "Lik Vaclava Havela na fontanama u povodu 80. godišnjice rođenja". ^ "The Václav Havel Bench". ^ "Pocta Havlovi. Jako čtvrtý Evropan má v americkém Kongresu bustu | Svět". Lidovky.cz. 19 November 2014. Retrieved 18 February 2017. ^ "Havel má jako první cizinec bustu v irském parlamentu. Byl výjimečnou osobností, říká politik" (in Czech). Retrieved 18 February 2017. 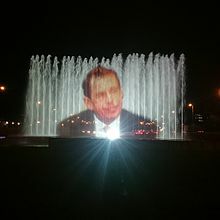 ^ "Statue of Vaclav Havel Erected in Tbilisi". Georgia Today on the Web. ^ a b Biographies and bibliographies, "Havel at Columbia: Bibliography: Human Rights Archive". Retrieved 29 April 2007. ^ Sam Beckwith, "Václav Havel & Lou Reed", Prague.tv 24 January 2005, updated 27 January 2005. Retrieved 26 April 2007. The Velvet Revolution or Gentle Revolution was a non-violent transition of power in what was then Czechoslovakia, occurring from 17 November to 29 December 1989. Popular demonstrations against the one-party government of the Communist Party of Czechoslovakia included students and older dissidents. The result was the end of 41 years of one-party rule in Czechoslovakia, and the subsequent dismantling of the planned economy and conversion to a parliamentary republic. Václav Klaus is a Czech economist and politician who served as the second President of the Czech Republic from 2003 to 2013. He also served as the second and last Prime Minister of the Czech Republic, federal subject of the Czech and Slovak Federative Republic, from July 1992 until the dissolution of Czechoslovakia in January 1993, and as the first Prime Minister of the newly-independent Czech Republic from 1993 to 1998. 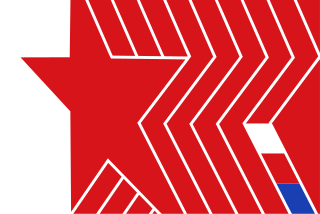 The Communist Party of Bohemia and Moravia is a communist party in the Czech Republic. It has a membership of 42,994 (2016) and is a member party of the European United Left–Nordic Green Left bloc in the European Parliament. The Civic Forum was a political movement in the Czech part of Czechoslovakia, established during the Velvet Revolution in 1989. The corresponding movement in Slovakia was called Public Against Violence. Ladislav Smoček is a Czech writer, playwright and theater director. Alexandr Vondra is a Czech politician and diplomat who served as Minister of Defence from 2010 to 2012 under Prime Minister Petr Nečas. Vondra also served as Deputy Prime Minister for European Affairs between 2007 and 2009, as well as Minister of Foreign Affairs from 2006 to 2007, both in cabinets of Prime Minister Mirek Topolánek. Vondra is also former Senator from Litoměřice (2006—2012) and Czech Ambassador to the United States (1997—2001). Olga Havlová, born Šplíchalová was the first wife of Václav Havel, the last President of Czechoslovakia and first President of the Czech Republic. Pavel Landovský was a Czech actor, playwright and director. He was a prominent dissident under the communist regime of former Czechoslovakia. Indirect presidential elections were held in the Czech Republic in January and February 2003 to elect a new President. The Parliament of the Czech Republic failed to elect a candidate on the first two ballots on the 15 and 24 January. However, on the third round of the third ballot on 28 February, Václav Klaus was elected. Lucerna Music Bar is a concert club housed within the Lucerna Palace, located on a hallway or "passage" that connects Vodičkova and Štěpánská streets near historic Wenceslas Square, in the New Town area of Prague in the Czech Republic. The name Lucerna means "lantern" in Czech. Lucerna Palace is an Art Nouveau building built by former President Václav Havel's family. The Lucerna Music Bar is one of the venues within Lucerna Palace involved in the Prague International Jazz Festival and the AghaRTA Prague Jazz Festival. It was used for the Václav Havel Tribute Concert, held in Václav Havel's honor, upon his death in 2011. The Lucerna Music Bar is similar in size to Washington, DC's 9:30 Club, Cleveland's Agora Theatre and Ballroom, Philadelphia's Trocadero Theatre, or Baltimore's Rams Head Live!, however the selection of artists is more international. The Lucera Music Bar has played a role in giving exposure to many bands from the Czech Republic and around the world. Vinohrady Cemetery is a large cemetery in Vinohrady in Prague 10 which contains Strašnice Crematorium. It is the second largest cemetery in Prague and is registered in the state list of cultural monuments. The remains of two Czech presidents are in this cemetery. President Václav Havel was a national hero whereas President Emil Hácha did not have his name put on his gravestone when he was buried in 1945.